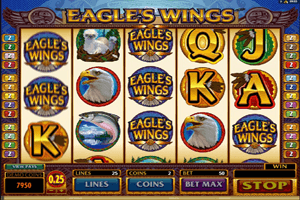 Eagles Wings is a wild life themed video slot machine that is powered by Microgaming. The game will take players into the wild life of the great American environment where they can be one with nature while reaping on the great rewards that the slot machine has to offer them. So pack your bags and get ready for a wild life experience like no other. All of the symbols are inspired by the wild life, this is why players will see an Eagle, a fish and a flying eagle as well as card symbols that have eagle feathers around them. The game has a high paying format of 25 lines and 5 reels. Players can decide how many coins they want to place in bets at the control panel at the bottom. They will pick the number of lines, the value of the used coins as well as the number of coins on each line. The logo of the game, The Eagle’s Wings is the wild icon of the game which can replace any of the other icons in order to aid players in forming a winning combo to earn a reward. Apart from the wild symbol, players can earn free spins by triggering the free spins bonus round by getting 3x scatter symbols, the lucky eagle symbol, on the reels of the game.